Someone once said that, “when it comes to role-playing games, the most important thing is location, location, location!” Or something like that, because all the action needs a somewhere. 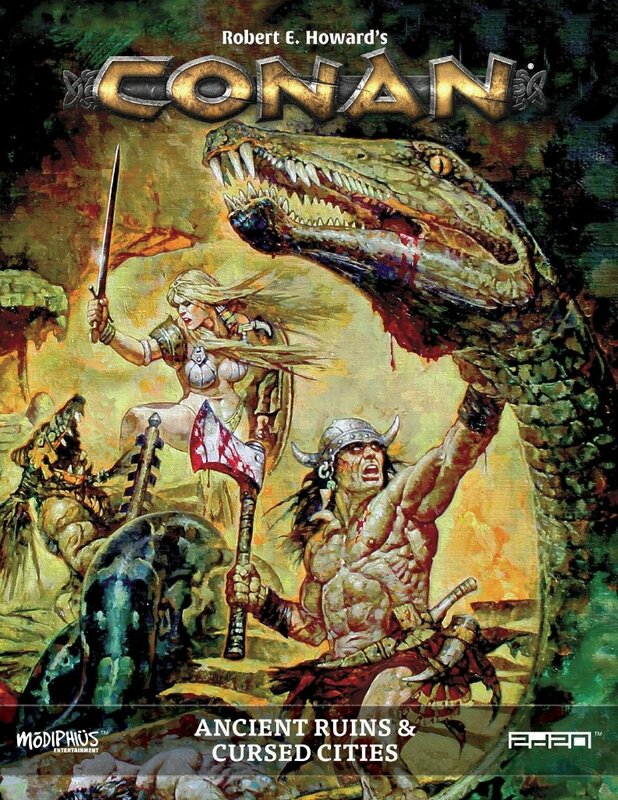 With Conan: Ancient Ruins & Cursed Cities, publisher Modiphius has added a book that helps sprinkle far-flung locations into an existing world. Excluding the introduction and the chapter on treasure, the book effectively has two sections, sites derived from existing fiction, and rules/guidelines for creating your own places. Interestingly, there are a few maps in this book. Most destinations contain, an overview, the kind of threats players might face, and suggestions for what successful explorers should receive for their efforts (experience and treasure). Additionally, it would be relatively easy to re-use the material here in completely different games. However, the two chapters helping people create ruins, and offering suggestions for breathing life into the environment are where this book excels. The writing is substantive, compact, and offers insight into how Howard thought about the world he created. There are also some traps and tables that can be made use of without much prep work. Overall, the book is mixed. At 120 pages, the PDF was never a challenge to get through. Aside from a few hiccups here and there, both editing and layout are quality, and some excellent art combine to make this an attractive book. All throughout, notes refer the reader back to the core rule book, doing a good job of tying the supplement back to the base rules. The specific sites listed are interesting and fun, but sometimes the book feels a bit confused. While Howard may have tied his fictional world to that of H.P. Lovecraft, it often felt like the additions of Lovecraft’s ideas steered the text away from the world of Conan, and into something else. The muddled tone made it awkward when trying to conceive of a single consistent game-world. Additionally, it would have been nice to have had a bibliography of some sort for the works cited throughout the text. 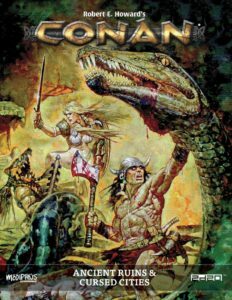 Regardless, the book is a good addition to the Conan line, and contains intriguing places for players to explore. For anyone that wants to scatter their maps with the Hyborian Age’s ancient past, this is an entertaining addition to the product line.